Summary. Aim: To examine frequencies and spectrum of genomic alterations in Ukrainian patients diagnosed with primary myelofibrosis (PMF). Materials and Methods: We enrolled 30 Ukrainian patients diagnosed with PMF who were previously tested for usual mutations in mye­loproliferative neoplasms driver genes (JAK2, MPL and CALR). Genomic DNA samples were obtained from peripheral blood leukocytes of these patients. Copy number alterations and copy-neutral loss of heterozygosity (cnLOH) were assessed using a high-density CytoScan HD microarray platform. Statistical significance was evaluated by the Fisher exact test. Results: We identified frequent genomic alterations, but no significant difference in the rates of copy-number loss, copy-number gain, cnLOH, or multiple genomic alterations were found in the groups of PMF patients that were positive for one of the usual mutations in driver genes or negative for such mutations (33.3% and 55.6%, p = 0.4181, 19.0% and 11.1%, p = 1.0000, 61.9% and 44.4%, p = 0.4434, 33.3% and 55.6%, p = 0.4181, respectively). The most frequent alterations were cnLOH at 1p36-1p22, 9p24.3-9p13.3 and 11q12.3-11q25; copy number loss at 7q21-7q36.3 and 13q12.3-13q14.3. Copy number alterations and cnLOH commonly affected the EZH2, LAMB4, CBL, CUX1, ATM, RB1 and TP53 genes, in addition to JAK2, MPL and CALR. Conclusion: We demonstrated the spectrum of genomic alterations in the groups of the Ukrainian PMF patients with or without the usual mutations in the specific driver genes. We identified several potential genes, which may be involved in the myeloproliferative neoplasms development and their phenotype modification (EZH2, LAMB4, CBL, CUX1, ATM, RB1 and TP53). Abbreviations used: cnLOH — copy-neutral loss of heterozygo­sity; ET – essential thrombocythemia; MPN – myeloproliferative neoplasm; PMF – primary myelofibrosis; PV – polycythemia vera; SNP – single-nucleotide polymorphism. Primary myelofibrosis (PMF) is a clonal disorder of early hematopoietic stem cells manifesting as bone marrow fibrosis and pancytopenia and classified as BCR-ABL-negative myeloproliferative neoplasm (MPN) . PMF patients are characterized by a severe disease course and worse prognosis, compared with patients of other MPN subtypes: polycythemia vera (PV) and essential thrombocythemia (ET). MPNs are driven by acquired somatic mutations of JAK2, CALR and MPL genes in more than 85% of cases . Studies of chromosomal alterations in MPN patients revealed that they occurred more frequently in PMF patients (50%) compared with PV (15%) and ET (5%) patients. Some alterations were detected recurrently: deletions of 20q, 18q, 13q and 12p; trisomy of chromosomes 8 and 9; copy number gain at 1p, 9p, 17q; and various translocations [3, 4]. Chromosomal alterations in PMF patients, such as trisomy of chromosome 8, deletions of 7, 7q, 5, 5q, 12p, inversion of chromosome 3 are considered as an unfavorable karyotype and used for the risk stratification for these patients . Improved methods for genomic alterations studies, from standard karyotyping with limited sensiti­vity to the high-resolution single-nucleotide polymorphism (SNP) arrays, allowed detection of short regions of copy number alterations and copy-neutral loss of heterozygosity (cnLOH). Thus, oncogenic microalterations can be studied, in particular, in MPN patients. This increases the search power for identification of potentially involved genes in MPN development (as 10–15% of MPN patients are negative for known mutations of the specific driver genes) [2, 5–7]. The aim of the study was to examine frequencies and spectrum of genomic alterations (copy number alterations and cnLOH) in Ukrainian PMF patients. 30 Ukrainian PMF patients, previously tested for mutations in MPN driver genes (JAK2, MPL and CALR), were enrolled in the study. There were 13 JAK2 V617F-positive, three MPL W515-positive and five positive for CALR gene mutations PMF patients. Nine PMF patients were negative for these mutations. Each patient signed an informed consent in accordance with the Declaration of Helsinki. The study was approved by the local Ethical Committee at the National Research Center for Radiation Medicine (Kyiv, Ukraine). DNA samples were obtained from peripheral blood leukocytes of PMF patients, using a Quiamp DNA extraction kit (Qiagen, Hilgen, Germany). Copy number alterations and cnLOH were assessed, using a High-density Affymetrix CytoScan HD oligo-SNP microarray platform (Affymetrix, Santa Clara, CA, US). Digested and labeled genomic DNA was hybridized to 2.67 million probes according to manufacturer’s recommendations. The Chromosome Analysis Suite (ChAS) software version 3.1 (Affymetrix) was used to analyze the data. 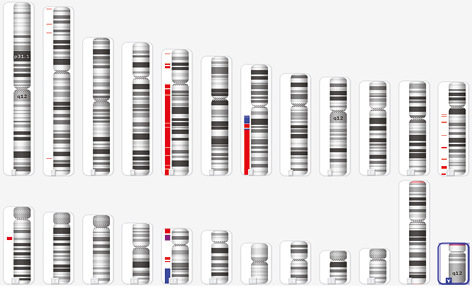 The genome assembly version GRCh37/hg19 was used as a reference. All genomic alterations were visually inspected and confirmed, and regions with poor quality were excluded. The regions with at least 50 markers (over 200 kb (50 markers over 100 kb for leukemia regions) were considered for gains, 30 markers over 50 kb (15 markers over 20 kb for leukemia regions) — for losses, and a minimum length of 5 Mb (3 Mb for leukemia regions) — for cnLOH. An online catalog of human genes and genetic disorders Online Mendelian Inheritance in Man (OMIM) was used to identify leukemia-related genes within the altered regions. Statistical significance was evaluated by the Fishers exact test. Copy-number alterations and cnLOH were frequently found in Ukrainian PMF patients (Table, Fig. 1). There were 71.4% (15/21) of cases with genomic alterations among PMF patients positive for one of known driver gene (JAK2, MPL or CALR) mutations and 55.6% (5/9) of cases — among PMF patients negative for these mutations (p = 0.4311). However, here was no significant difference in the rates of copy-number loss, copy-number gain, cnLOH, or multiple genomic alterations, respectively, in these groups of PMF patients (33.3% and 55.6%, p = 0.4181; 19.0% and 11.1%, p = 1.0000; 61.9% and 44.4%, p = 0.4434; 33.3% and 55.6%, p = 0.4181). The most frequently altered regions were cnLOH at 1p36-1p22 (N = 6), 9p24.3-9p13.3 (N = 3) and 11q12.3-11q25 (N = 3); copy number loss at 7q21-7q36.3 (N = 5) and 13q12.3-13q14.3 (N = 2). Our findings are consistent with published data [3, 4, 7]. CnLOH at 9р, 1р and 19р duplicated the usual driver gene (JAK2, MPL or CALR, respectively) mutations in 33.3% (7/21) of cases among the subset of PMF patients that were positive for one of these mutations. The length of these altered regions varied from 13.7 to 93.6 Mb (Table, Fig. 2). A shorter genomic fragment (1 Mb) of cnLOH with duplicated MPL gene mutation was visually detected in a PMF patient (ID 842) and considered as leukemogenic. Note: Chr – chromosome; GAIN – copy-number gain; LOSS — copy-number loss; Mb – megabase. *Percentage of DNA with identified cnLOH, GAIN or LOSS among studied DNA sample. In PMF patients, the most frequently affected genes due to copy number alterations and cnLOH in addition to JAK2, MPL and CALR were EZH2, LAMB4, CBL, CUX1, ATM, RB1 and TP53 genes (Fig. 3). Copy number losses of EZH2 at 7q36.1 were detected in three PMF patients negative for usual driver gene mutations and in one JAK2 V617F-positive PMF patient. Epigenetic regulator EZH2 is a member of Polycomb Repressive Complex 2 which is involved in H3K27 trimethylation. Loss of function mutations and cytogenetic alterations of EZH2 are frequently observed in MPN patients. Recent studies showed that EZH2 alterations may be early events in leukemogenesis [8, 9]. Other studies demonstrated that EZH2 loss can dramatically modify the myeloproliferative phenotype reducing survival in the presence of JAK2 V617F mutation. During disease initiation stage, the cooperation between EZH2 alterations and JAK2 V617F mutations increases the ability of JAK2 V617F-positive stem cells to self-renewal . Interestingly, the mentioned JAK2 V617-positive PMF patient (ID 638) with coexisting EZH2 loss at 7q36.1 had multiple chromosome alterations indicating genomic instability potentially caused by this harmful initial combination (Fig. 4). This patient had additional copy number losses at 2p (involving epigenetic regulator DNMT3A and TP53I3 gene which cooperates with p53 in cell death control); 5p and 5q; 12q (involving SH2B3 gene which assists in JAK2-signaling regulation); 13q and 17q (involving well-studied across different malignancies RB1 and TP53 genes, respectively). Altered DNA burden for these regions with copy number losses ranged from 24 to 88%, but most of them were closed to 40–50%, suggesting their relation to the same leukemogenic cell clone. Proto-­oncogene CBL encodes E3 ubiquitin ligase which negatively regulated JAK2-signaling due to JAK2 molecules ubiquitination and degradation. Even though, there is no evidence confirming ability of CBL gene mutations to drive disease, it was shown that they increase cell proliferation due to hypersensitivity to cytokines . In the study we observed two JAK2 V617-positive PMF cases with CBL homozygous loss, indicating that impaired ubiquitination of signaling molecules might give advantages to myeloproliferation. The LAMB4 gene variants were reported in studies on myeloid neoplasms previously, but their biological function remains unknown in MPN . cnLOH of DNA-damage response ATM gene and copy number loss of TP53 suggest their contribution to the disease evolution due to loss of DNA repair function. Another interesting gene was POT1 which was deleted in two cases of PMF patients who harbored multiple genomic alterations (Table 1). This gene encodes a nuclear protein involved in the telomere maintenance, regulating its lengths, protecting chromosome ends from illegitimate recombination and abnormal chromosome segregation. Significantly shortened telomeres, activation of telomerase, and altered expression of telomere-associated proteins are common features of various hematologic malignancies . Recent study reported the use of an oligonucleotide that targets the RNA template of a human telomerase reverse transcriptase and inhibits its activity in some PMF patients . Thus, the role of impaired POT1 protein is most likely implemented in cooperation with other damaging genomic alterations. The study demonstrates the spectrum of genomic alterations in Ukrainian PMF patients that are positive and negative for usual mutations in MPN driver genes (JAK2, MPL or CALR). We have identified several genes potentially involved in the disease development and phenotype modification (EZH2, LAMB4, CBL, CUX1, ATM, RB1 and TP53). Shantzer L, Berger K, Pu JJ. Primary myelofibrosis and its targeted therapy. Ann Hematol 2017; 96: 531–5. Milosevic Feenstra JD, Nivarthi H, Gisslinger H, et al. Whole-exome sequencing identifies novel MPL and JAK2 mutations in triple-negative myeloproliferative neoplasms. Blood 2016; 127: 325–32. Klampfl T, Harutyunyan A, Berg T, et al. Genome integrity of myeloproliferative neoplasms in chronic phase and during disease progression. Blood 2011; 118: 167–76. Rice KL, Lin X, Wolniak K, et al. Analysis of genomic aberrations and gene expression profiling identifies novel lesions and pathways in myeloproliferative neoplasms. Blood Cancer J 2011; 1: e40. Rumi E, Cazzola M. Diagnosis, risk stratification, and response evaluation in classical myeloproliferative neoplasms. Blood 2017; 129: 680–92. Tefferi A, Sirhan S, Sun Y, et al. Oligonucleotide array CGH studies in myeloproliferative neoplasms: Comparison with JAK2 V617F mutational status and conventional chromosome analysis. Leuk Res 2009; 33: 662–4. Poluben L, Puligandla M, Neuberg D, et al. Characteristics of myeloproliferative neoplasms in patients exposed to ionizing radiation following the Chernobyl nuclear accident. Am J Hematol 2019; 94: 62–73. Score J, Hidalgo-Curtis C, Jones AV, et al. Inactivation of polycomb repressive complex 2 components in myeloproliferative and myelodysplastic/myeloproliferative neoplasms. Blood 2012; 119: 1208–13. Martínez-Avilés L, Besses C, Álvarez-Larrán A, et al. TET2, ASXL1, IDH1, IDH2, and c-CBL genes in JAK2- and MPL-negative myeloproliferative neoplasms. Ann Hematol 2012; 91: 533–41. Vainchenker W, Kralovics R. Genetic basis and molecular pathophysiology of classical myeloproliferative neoplasms. Blood 2017; 129: 667–79. Aranaz P, Hurtado C, Erquiaga I, et al. CBL mutations in myeloproliferative neoplasms are also found in the gene’s proline-rich domain and in patients with the V617FJAK2. Haematologica 2012; 97: 1234–41. McClure RF, Ewalt MD, Crow J, et al. Clinical significance of DNA variants in chronic myeloid neoplasms (CMNs): A report of the association for molecular pathology. J Mol Diagnostics 2018; 20: 717–37. Wang L, Xiao H, Zhang X, et al. The role of telomeres and telomerase in hematologic malignancies and hematopoietic stem cell transplantation. J Hematol Oncol 2014; 7: 61. 1Tefferi A, Lasho T, Begna K, et al. A pilot study of the telomerase inhibitor imetelstat for myelofibrosis. N Engl J Med 2015; 373: 908–19.